So last weekend I was searching for recipes for this Maharashtra dish called misal pav. It all started a couple of months ago when I was looking for a recipe for goda masala hoping to try out a new kind of dal. The way I find new recipes to try is kind of random. I’ll look up one thing, see another thing, and so on. I don’t even know where I heard about goda masala, but I’m glad I did because it is delicious! Anyways, I was trying to find other things to make with goda masala and ran across misal pav. Misal means mixture and pav means bread. 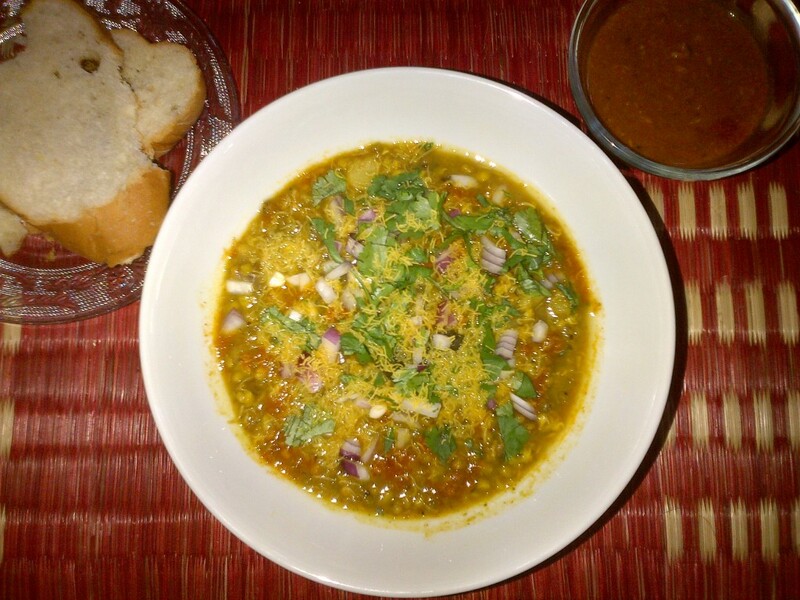 This dish is made of a moth bean sprout curry (usal) topped with a spicy gravy, called kat, sev, onions, cilantro and other indian snackies. Unfortunately I couldn’t find moth beans, so I sprouted mung beans instead. There are many recipes out there, but I tried my version of this one. While the ingredients gave me an idea of what it should taste like, I kind of did everything a little differently. I started this last weekend sprouting the mung beans, but just had it for lunch yesterday and Tejas had it for breakfast today. He said it was really good! He hadn’t had it before, but said it reminded him of something called googni. Which now I’ll probably try and make sometime :-). 1. Soak one cup of mung beans for 12 hours. 2. Drain and wrap in a wet town and put in a dark place (cupboard, stock pan w/ lid, etc.). 3. Leave for 1-2 days until they start to sprout. 4. Rinse and store in fridge until you want to use. Dry roast the cumin, peppercorns, cloves, cinnamon in a pan until they get a little fragrant, and gind into a powder with the coriander powder and chili powder (you could toast whole coriander instead, it is just that we have the powder fresh from Tejas’s mom and it is so good!). Heat oil in a sauce pan and add the chopped onions, and then after a few minutes, add the garlic and ginger and cook until the onions are translucent and browned. Add the ground spices and fry for a couple of minutes. Add the tomatoes and coconut and cook until it becomes a paste. Blend the mixture in a blender with a little water. Add the past back to the pan with a cup or two of water, the liquid from the soaking kokum, and salt to taste. Cook until the oil starts to separate. Heat 2 teaspoons of oil in a pressure cooker. Sauté onions until a little soft. Add potato, sprouted mung beans, and water. Cover and heat on high until the first whistle, then turn down to medium and cook for about 7 minutes. Add kokum water, jaggery, turmeric, chili powder, and goda masala. In a tadka or other small pan heat the rest of the oil and add the mustard seeds and cumin seeds. Once the mustard seeds start to pop add the curry leaves and hing and cook for another couple of seconds, then pour into the usal. 1. Put usal in a bowl. 2. Top with kat and toppings. 3. Leave bowl of kat on the side for whomever might want more spiciness! 4. Serve with buttered pan toasted bread (pav). I don’t have a lot of patience for letting things cool, therefore I throw the before-paste into the food processor and put in the freezer for a few minutes. Voila, cold and ready to go! I don’t have an Indian grinder (yet), so I use a number of different tools such as a big and a small food processor and a coffee grinder. I want a grinder! I soak the kokum by putting it in a little bowl with water in the microwave for a minute or two. Then I use the water in the dishes. I think you could also use tamarind if you didn’t have kokum. You can use nice little buns, but any bread in a pinch. I used some old baguette when I had it and Tejas used whole wheat slices.